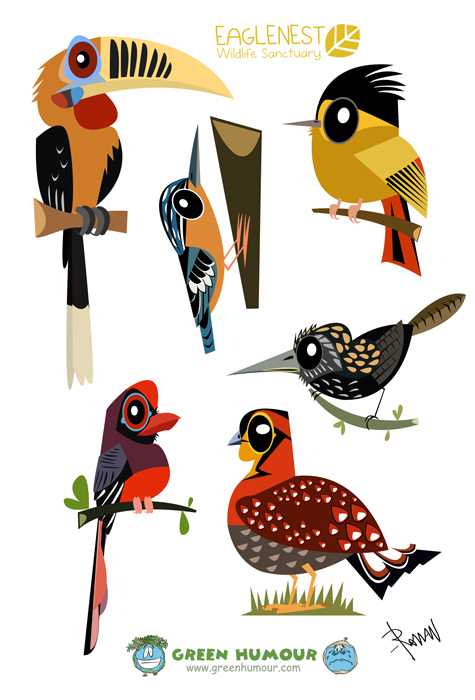 As most of you might know, my bird caricatures were a part of the Arunachal Bird Festival held at the Eaglenest Wildlife Sanctuary earlier this month. Because of an unprecedented militancy surge in the state, there was a bit of chaos, but that didn't deter the spirit of the event much. I'm also glad that a prelude to the event was held at the National Centre for Biological Sciences, Bangalore, where lots of the prints and merchandise sold off before hand. The trip for me was nothing short of life-changing, as it not only popularized by bird caricature series, but also instilled tremendous confidence in me about these funny looking fowls I draw! (Also, birders would be interested in knowing this- on my very first birding trek in the North-east, I got to see the Bugun Liocichla, the rare new babbler described from the region in 2006). By the end of the trip, I not only felt enriched having seen one of the most beautiful birding venues in the world, but also felt ecstatic at having my bird count leap up by more than 60 species! These stickers of the Bugun Liocichla can be seen all around the camps. The venue of the events. A skit performed by schoolkids on the demerits of hunting on communities. 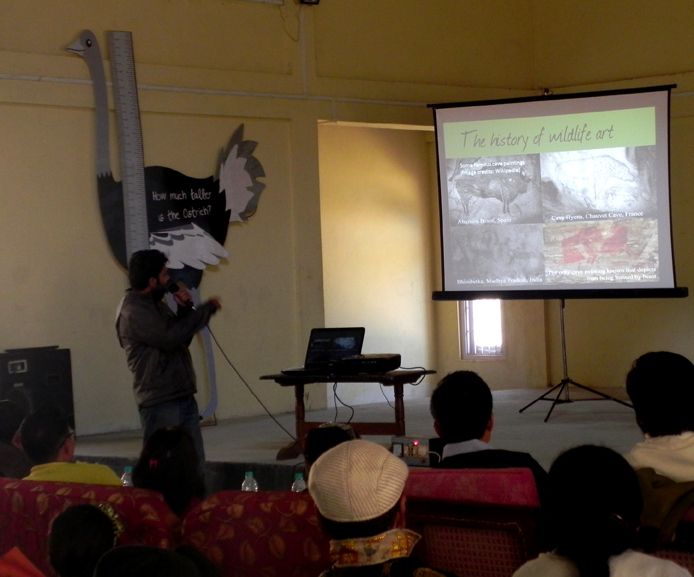 I delivered a talk on art and wildlife. This supremely talented designer, Soujanyaa Boruah designed boxes with heat sensors that played the calls of the respective birds as you walked past them! The bird call boxes with the bird caricatures on them. We also had a little drawing contest for the kids. I participated too! My favourite entry- the Beautiful Nuthatch. I tried to draw the Rufous-bellied Eagle but lost to the kid above! And finally we proceeded to paint a wall with the kids, full of birds. Soujanyaa and the kids did all the work here. And a wonderful folk dance to one of those melodious tunes of the mountainfolk to end the show. Gorgeous. Everything on this page. Hey is it possible to buy the posters online?